Donna Marie O’Donovan is a Dutch-Irish cultural manager based in Dublin, Ireland. Throughout her career, she has worked across a range of major cultural institutions and projects, establishing a focus on the development of collaborative and shared-value partnerships. Her work has spanned a broad multidisciplinary spectrum that includes theatre, design, visual arts, architecture, heritage, arts education and cultural policy research. 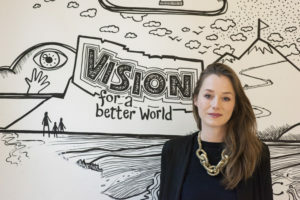 Currently Development Officer at the Abbey Theatre, Ireland’s national theatre, O’Donovan was previously International Project Coordinator for Irish Design 2015, a landmark year celebrating and promoting Irish design globally, during which she collaborated with public and private sector partners to deliver a portfolio of international exhibitions, events and initiatives across Europe and around the world. O’Donovan has a Bachelor of Arts in Drama Studies and the History of Art and Architecture from Trinity College Dublin and a Master of Arts in Cultural Policy and Arts Management from University College Dublin.